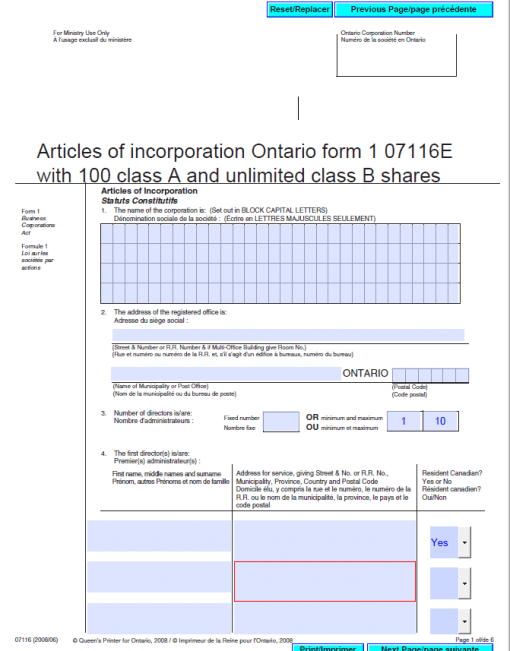 Completed articles of incorporation Ontario sample in a fillable PDF with 100 classes A and unlimited B shares. All you need to do is enter your corporation name, address, and the initial directors' names and addresses on the first page. 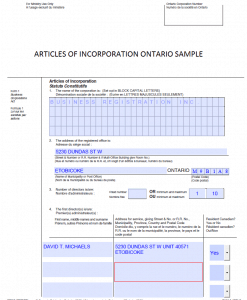 Buy and download these pre-completed articles of incorporation Ontario sample in a fillable PDF. These sample articles of incorporation are structured with 100 classes A and unlimited B shares. All you need to do is enter your corporation name, address, and the initial directors’ names and addresses on the first page. How many pages do these articles of incorporation contain? 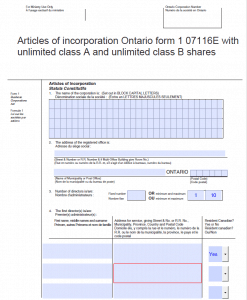 These articles of incorporation with 100 Class A shares and unlimited class B shares contain 6 pages. This pre-completed articles of incorporation Ontario sample are ideal for those who need a simple corporate structure to divide ownership in a simple manner without raising future rounds of investment from outsiders. These articles of incorporation allow you to issue an unlimited number of Class B shares without losing control of the business. Provide founders with the ability to retain control over their corporation by retaining ownership of the class A shares, even after obtaining funding through the sale of class B shares. Provide holders of class A shares to a dividend as declared by the board of directors, from time to time. No dividends are payable to holders of class A shares in years when the corporation lacks profits. Provide holders of class B shares to a dividend as declared by the board of directors, from time to time, before holders class A shares are paid. No dividends are payable to holders of class B shares in years when the corporation lacks profits. Includes share transfer restrictions so that you may raise money from friends, family, and an Angel investors. These articles are not designed for VC investors because they need more than 100 class A shares. Articles include other provisions so that the corporation may borrow money from banks and others. It is hereby provided that no shares of a class of shares shall be issued unless the shares have first been offered to the shareholders holding shares of that class, and those shareholders have a preemptive right to acquire the offered shares in proportion to their holdings of the shares of that class, at such price and on such terms as those shares are to be offered to others. The quorum for any board of directors meeting held electronically or in person shall be two-thirds of the actual total number of directors. The number of shareholders in the Corporation, exclusive of employees and former employees who, while employed by the Corporation were, and following the termination of that employment, continue to be, shareholders of the corporation is limited to not more than fifty, two or more persons who are the joint registered holders of one or more shares being counted as one shareholder. Any invitation to the public to subscribe for securities of the Corporation is prohibited, unless and until necessary filings have been submitted to a securities regulatory authority. File this form together with a cover letter and a Nuans search report with the Ministry of Government Services to incorporate an Ontario business corporation under the Business Corporations Act. 375 University Avenue, 2nd Floor, Toronto, Ontario (go up the escalator and through the glass door). We recommend that you park under Nathan Phillips Square at City Hall, as street parking is limited on University Avenue and your car will be towed after 3 pm. You may pay via Visa, MasterCard, or cash. Lawyers may pay by cheque. INCORPORATED, INCORPORÉE, CORPORATION, LIMITED or LIMITÉE or the corresponding abbreviation INC., CORP., LTD. or LTÉE. If you incorporate ABC HOLDINGS INCORPORATED, you must always use ABC HOLDINGS INCORPORATED, because someone else may register ABC HOLDINGS INC.; this is very common among holding companies. It is always best to register the name exactly the way you plan on using it. And remember, there is very limited space on cheques to write a payee name, so try to keep your name short. NUANS reports automatically expire after 90 days. Old reservations will still appear on new reports run within 180 days of the original report. NUANS is a computerized search system that compares a proposed corporate name with databases of existing corporate entities, sole-proprietorships, partnerships, ULC entities, LCC entities, and trademarks using an automated algorithm. The report reserves the proposed name and lists similar names of existing businesses and corporate entities in Ontario and most of Canada as well as the trademarks that are most similar to the proposed name. This search must be submitted together with the duplicate Articles of Incorporation within 90 days from production by the NUANS system. For example, articles submitted on November 28th may be accompanied by a NUANS name search report dated as early as August 30th, but not dated earlier. Type or print the corporate name in CAPITAL LETTERS exactly the way it appears in your Ontario Nuans report, including the legal ending that you choose. Fill in your business address. For the average incorporation, we recommend putting in: minimum 1 and maximum 10 directors. If you have a special situation, we recommend that you meet with a corporate lawyer to determine what numbers of directors are best for your particular situation. List the name(s) of each initial or first director(s), including first name, middle names and surname, and the address for service for each of the first directors. – The address should include the street name, street number, suite (or R.R. #), municipality, province, country and postal code. – Directors must be individuals, not corporations. – State if the director(s) is/are Resident Canadian(s). – At least 25% of the directors must be resident Canadians (if 25% of the directors is not a whole number round up to the nearest whole number). Where a corporation has less than four directors, at least one must be a resident Canadian. Find out whether your business must state that it has restrictions on the business that the corporation may carry on or on the powers that the corporation may exercise. This may occur with some professions and it would be stated in the applicable governing legislation if any. Most businesses have no restrictions on what business they may also carry on; they would write: NONE. You do not require a name search for an Ontario numbered name. 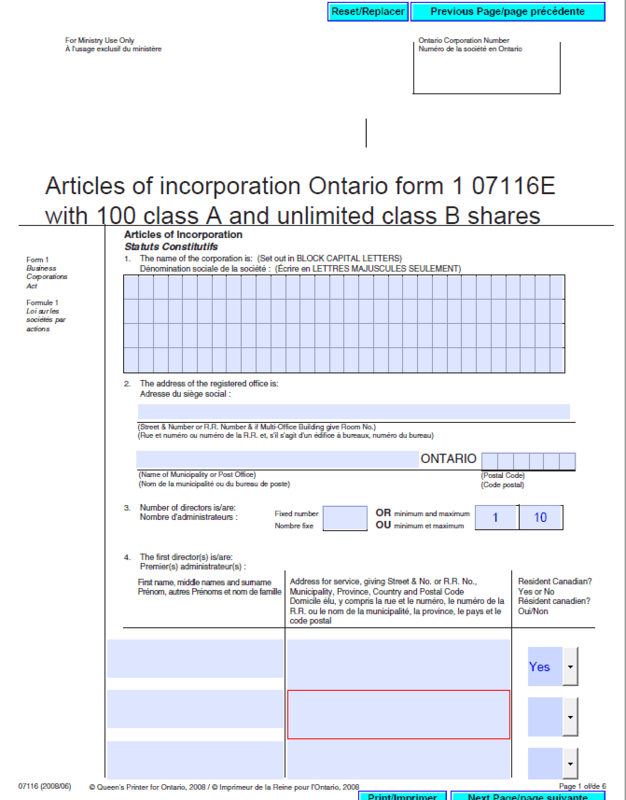 In article one on the form, leave nine empty boxes, then type or print in block capital letters the word “ONTARIO” followed by one of the following legal elements: LIMITED, LIMITÉE, INCORPORATED, INCORPORÉE, CORPORATION or the corresponding abbreviation LTD., LTÉE, INC., or CORP. The Companies and Personal Property Security Branch will assign a number to the corporation. Enclose a covering letter setting out the name of a contact person, a return address, and a telephone number. This will facilitate the processing of the articles should a question arise as to the content of the articles.